You may have heard many of your friends using a VPN service. VPN which stands for Virtual Private Network is one of the most useful applications made for the users. With the help of a VPN service, you can keep your identity protected on the net. Other than that, many people use it for various purposes, and its use is spread out in almost every part of the world. A VPN service comes with several benefits. Speaking of VPN, there are numerous VPN operators available in the market. Some will cost you a certain amount while others are free. However, not all VPN services come with equal benefits. Most of the free VPN services out there are not good enough as they cannot provide you with maximum protection. Therefore, it is advised you to use a paid VPN service so that you can make the most of it. With all the options available in the market, it is quite natural to get confused while choosing the right VPN service. For your convenience, we have reviewed the particular VPN service below in this article. VPN.AC has been ranked as one of the top VPN services out there, and therefore, there is no doubt that it is an efficient service. VPN.Ac offers you high-quality service. It keeps your network secure and provides you with an excellent performance. VPN.AC is a service that is based in Romania. This particular VPN service is known to provide its customers with advanced encryption, excellent performance, and extremely secure apps. The best thing about their servers is that entirely consists of dedicated premium servers along with self-hosted DNS. Not only that, but it also includes of gigabyte bandwidth channels as well. You can also avail double-hop server configurations, unique encryption protocols, and secure proxy browser extensions. In short, you can avail every benefit that you want from this VPN service. This particular VPN service is known to have an excellent track record. It is hard to point at any reason why anyone would not choose their service. One good thing about the VPN service is that it comes at a very affordable price as well. It is only $4.80 per month which is quite affordable for any user. Thus, you can avail a quality VPN service at a budget-friendly price. It is hard to find such offers out there. But now that you know about VPN.AC you should totally give it a try. In case, if you are looking forward to buying a new VPN service, then you can consider this one on your list. The VPN services come with steadfast bare-metal servers along with self-hosted encrypted DNS. It also has excellent obfuscation features along with various encryption options as well. The VPN service also provides you with secure proxy browsers. It also provides you with an excellent speed along with plenty of bandwidth as well. The only problem with this VPN service is that it has minimal connection logs. Now that you already know about the service and its pros and cons, let’s have a look at it’s a price. Most of the paid VPN services out there can cost you a lot. However, that is not the case with VPN.AC. 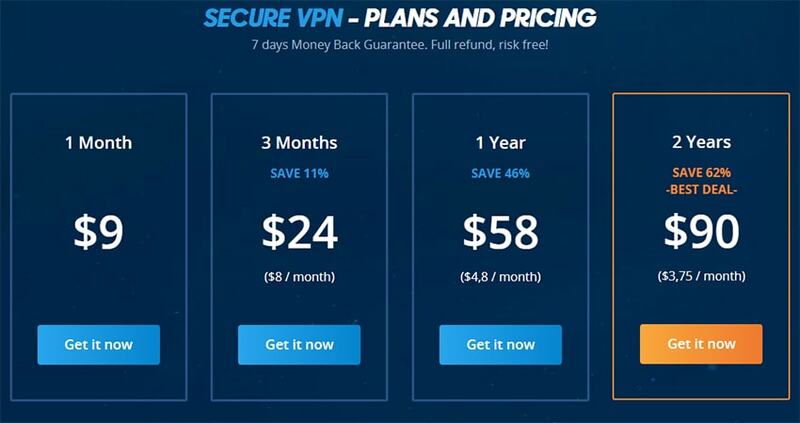 This premium VPN service is known to come with a very low price tag. It is going to cost you only $4.80 per month (Billed $58 annually) in return of which you can use to secure applications and servers. To put in a concise manner, it offers you excellent value for your money. Also, you can get dedicated servers at such a low price. Coming down to the payment options, the VPN service also offers you plenty of payment options as well. This is done to make things more convenient for users. Their payment options also include anonymous payment methods as well which include gift cards and Bitcoin. These are the following payment options that are provided by the VPN service. You can choose any of the above-mentioned payment options you want. It is up to your convenience which payment option you are going to pick. Another great thing about the company is that they also provide you with a money back guarantee within seven days as well. If you feel that their service is not good enough, then you are free to claim for your money back. The best thing is that they have a very clear refund policy. The company doesn’t hide anything from its customers. If you are not satisfied with their service, just ask your money back. You will get your refund back within seven days without any hassle. VPN.AC was created by an efficient team of security professionals in the year 2009. The team behind the VPN service is very much clear about their background and doesn’t hide anything about their company. This allows them to be transparent in front of their customers. The team members are also known to provide the contact information along with the professional certifications of the parent company which is Netsec Interactive Solutions. The headquarters of the parent company is at Sibu, Romania. The jurisdiction of VPN.AC falls under the Romanian jurisdiction and laws. The jurisdiction of Romania happens to be a solid one when it is about privacy. From this, you can very well understand the efficiency of the service regarding privacy. Another great thing about this VPN service is that it is developed to support various platforms and devices. This makes it users to use the service. The VPN service provides applications for all the major platforms including IOS, MAC OS, Windows, and Android. If you want you can also download the latest application directly from their official website. It will also provide you with the installation guide so that you don’t have to face any problem while installing it. When it comes to connections, VPN.AC is also given six connections per subscription. This is double the number of subscriptions that are provided by other well-known paid VPN services. However, it is less than the companies that provide you with an unlimited number of connections. OpenVPN, IPSec/L2TP, IKv2, and PPTP encryption protocols. If you are looking forward to getting a new VPN service, then VPN.ac can be a solid choice for you. With their premium quality service, they are ruling the charts. The company already has thousands of satisfied customers all around. By opting for the service of VPN.ac, you can avail high security, a lot of bandwidth and great speed. You can avail all of this at a very affordable rate as well. VPN.ac also gives you the liberty of using many different encryption options. This actually allows you to choose the best encryption strength based on how much security and privacy you are looking for. You can even optimize your performance as well. The default encryption protocol used by the company is OpenVPN ECC. This is known to offer a great combination of security and speed. You can read about the different encryption options provided by them on their official website. They have explained the different encryption options on their company website. With the help of the different encryption options, you can actually optimize your performance as well. In case, if you reside in an area where the use of VPN is restricted, you can benefit yourself by testing the various encryption protocols. VPN.ac also provides you with a secure proxy for browser extensions such as Chrome, Opera and Firefox. It provides strong encryption for all types of browsing activities. There is no need for the VPN to tunnel all the traffic through it. That’s because you can use the browser to tunnel the traffic through the servers. It also provides you with stealth against firewall as well. This is actually one of the greatest features provided by the VPN service. This is one of the main reasons why people love the service so much. Thus, from the above discussion, it is can be stated that VPN.ac is one of the best VPN services that are available out there. It provides you with every feature that you need and thus, you can choose to go for this service whenever you want.